If the UK leaves the European Union without a deal in place, Irish registered companies that have only UK resident directors will be required to comply with section 137 Companies Act 2014 which deals with the requirement to have a European Economic Area (EEA) resident director. Irish registered companies must have at least one director resident in a member state of the EEA. The EEA consists of the 28 member states of the EU, plus Iceland, Liechtenstein and Norway. If the UK leaves the European Union with no deal it will no longer be part of the EEA. We deliver Outsourced Company Secretarial Services that help you meet your regulatory, legislative & reporting requirements. 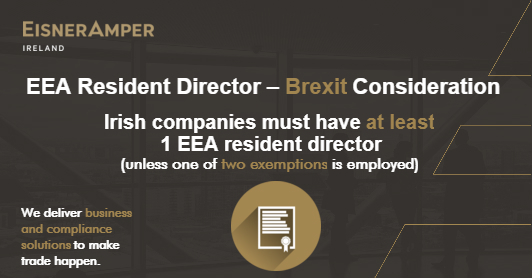 According to the Companies Registration Office (CRO), “it is a criminal offence not to have at least one EEA resident director of an Irish registered company” unless one of the two “EEA Resident Director Exemptions” below is employed. 1. Where a company holds a bond, in the prescribed form, in force to the value of €25,000 and which provides that in the event of a failure by the company to pay the whole or part of a fine imposed on the company in respect of an offence under the Companies Act 2014 or under the Taxes Consolidation Act 1997, there shall become payable under the bond a sum of money for the purpose of same being applied in discharge of the whole or part of the company’s liability in respect of any such fine or penalty. At EisnerAmper Ireland, our Company Secretarial Team can help you obtain the appropriate bond – learn more about our Company Secretarial Services, here. 2. If, following incorporation, a company applies for and is granted a certificate from the registrar of companies that the company has a real and continuous link with one or more economic activities that are being carried on in the State, that company will be exempted from the requirement to have at least one EEA resident director from the date of the certificate, as long as the certificate remains in force. Application for this certificate is made on Form B67, and must be accompanied by a statement from the Revenue Commissioners made within two months of the date of the application by a statement that the Revenue Commissioners have reasonable grounds to believe that the company has such a link. Get certificate application support – request a callback from our Company Secretarial Team, here. In addition to providing advice and support with your possible exemptions, our Company Secretarial Team can also assist with identifying and appointing an appropriate EEA resident director to your company. Learn more about our Company Secretarial Services, here. No. The CRO notes that, if the UK leaves the European Union without any deal in place, the external company will now be subject to filing annual returns with the CRO under the non-EEA country legislation. At EisnerAmper Ireland, our dedicated team of company secretarial professionals possess the knowledge and experience required to provide guidance and advice to companies setting up in Ireland for the first time. We also provide ongoing support and accounting services to organisations at every stage of their development. Learn more about our company secretarial services, here. Request a callback from our specialists now.